October, 2005. Taken with and old Sony DSC-S60. 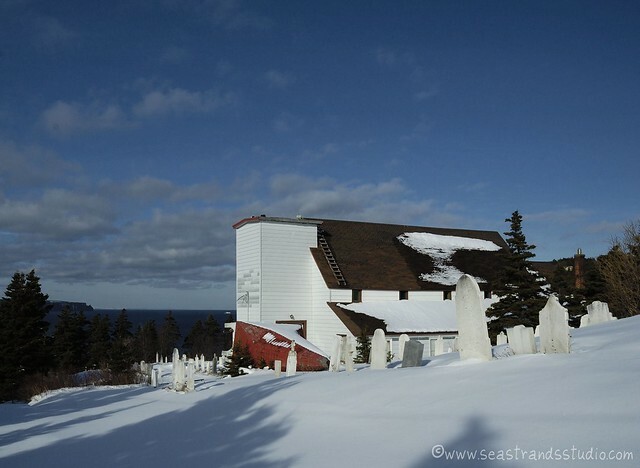 Six and a half years ago, while out on an autumnal exploration in October of 2005, I took this picture of the old Anglican Church in St. Philip’s Newfoundland. 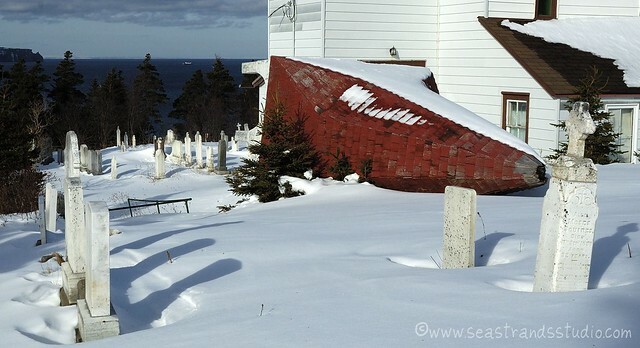 Built in 1894, this church building housed the heart of a community for many, many years. A new church building has since been built nearby and care was taken that the new structure should reflect the architecture of the old. They did a very nice job in this regard. Even though it hasn’t been used as a church since 2003, just before the new church was dedicated in 2004, it’s still rather an iconic structure in these parts, or was. The red steeple against the blue sky was quite striking and appeared on countless postcards. 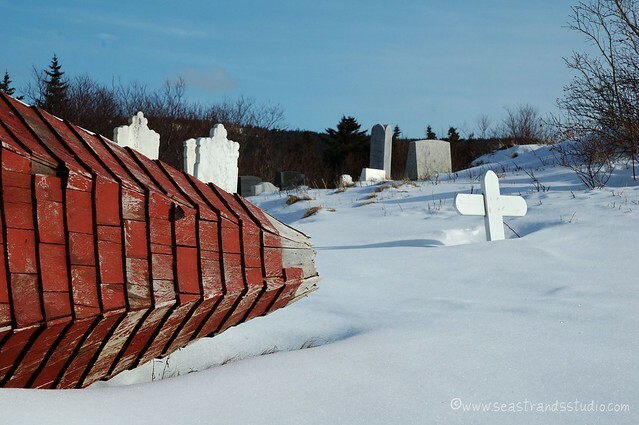 It was along a particularly beautiful stretch of the coastal drive of the northeast Avalon Peninsula and has a lovely little cemetery with a nice view of the bay and Bell Island. Simply put, it was a picturesque landmark and had been for a very, very long time. When you look inside the steeple, you can see that the main beams were hand-shaped and look very much like the ribs of a boat. What’s that, you say? 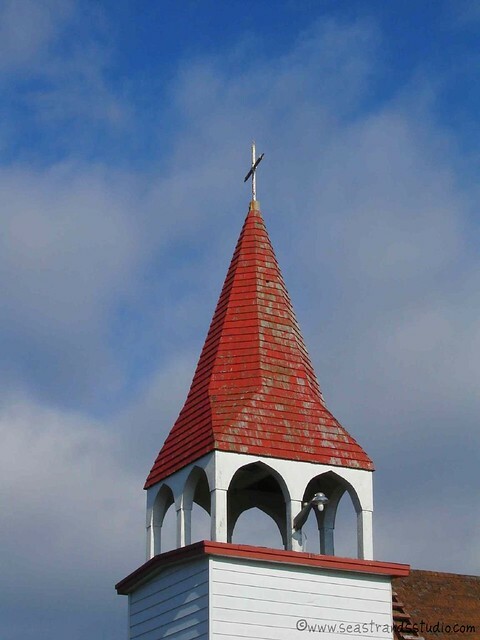 How am I able to see inside the steeple? 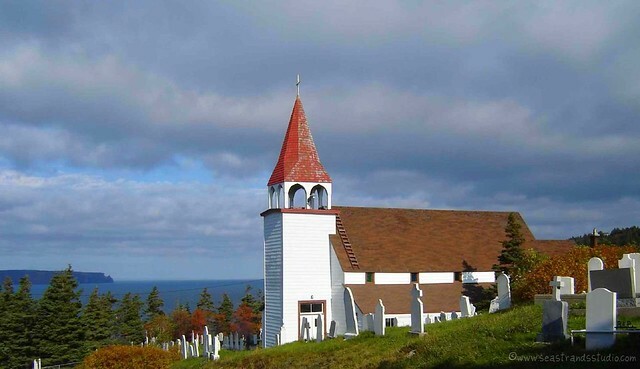 And why do I keep using the past tense to describe this lovely little church? No, I can’t fly. And I haven’t taken to scaling heritage buildings or breaking into churches and shuffling up into steeples. It’s an intriguing thought, but no, I’m a little too law-abiding for that (and my husband would have a hairy canary). Yep. That’s a steeple. On the ground. Some ________ (pick your word of choice and please, don’t restrain yourself) decided that they would make a point of some sort (heaven can only guess what that might have been, since we don’t know who did it) by lopping the steeple off one night (March 31, 2010, to be precise). If you want to read more about the fight that’s going on with regards to the church, have a look here. I’m not going to go into it all in this post. Here, here and here are more links. I’m not particularly interested in who did it or why. I cannot think of anyone who would be justified in doing such a thing for any reason and to my mind, actions like this only hurt whatever cause they may think they support. Of course, any suggested reasons for its destruction are purely speculative, since no one was ever caught nor did any group claim responsibility. Maybe it was to have been a particularly odd April Fool’s joke, although I don’t think anyone has seen anything particularly humorous about the situation. The unfortunate thing about the entire situation is that when a very visible icon or symbol in a community is damaged and not repaired, it hurts the whole community. It’s an expensive hurt, too, and not one that heals easily. If, as Sir Geoffrey Jellicoe, asserts, “Architecture is to make us know and remember who we are,” then architecture that remains in a state of disrepair seems to indicate a community that is broken or fragmented in some way. And that’s every bit as sad to me as the downed steeple.